This is the second in a series of papers which will examine the ethical and justice issues that are at the center of the Warsaw climate negotiations, often referred to as the 19th Conference of the Parties (COP-19). 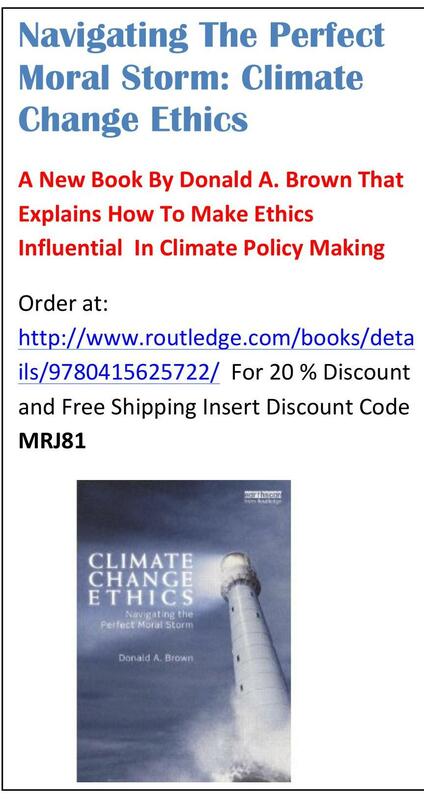 The first in the series can be found on Ethicsandclimate.org. This paper looks at the ethical issues entailed by the need for nations to dramatically increase their ghg emissions reductions commitments immediately, that is in the short-term, to levels that equity and justice would require of them. Each year in international negotiations, pleas of vulnerable developing nations have become louder calling for developed nations to respond to climate change in ways that are consistent with their ethical obligations. For the most part, this had utterly failed to happen. Yet, up until a few years ago, nations could ignore their ethical responsibilities provided they made any commitments at all to reduce their ghg emissions. 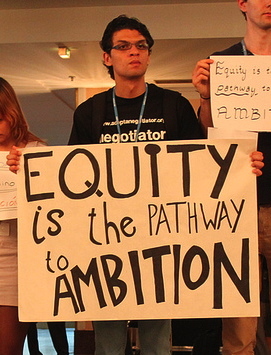 As a result, nations have failed to adopt climate change policies consistent with their equitable obligations despite the fact that all nations who are parties to the UNFCCC agreed, when they became parties, to reduce their emissions to levels required of them based upon “equity” to prevent dangerous anthropogenic interference with the climate system. Although most nations have now made some commitments that have included ghg emissions reductions targets starting in the Copenhagen COP in 2009, almost all nations appear to be basing their national targets not on what equity would require of them but at levels determined by their economic and national interests. In fact, in many cases when governments have been asked why they have not made more ambitious commitments, they have cited national economic justifications or their unwillingness to make more stringent commitments until other nations do so, excuses which are also based upon national interest rather than national global obligations. And so, for the most part, nations have entered the international climate negotiations as if their commitments to an urgently needed climate change global solution can be based on national interest rather than global responsibilities. However the longer nations have waited to respond adequately to climate change, the more difficult it has becomes to ignore what ethics and justice requires of them because climate science is telling the international community that it must immediately adopt a global approach to climate change which is much more ambitious than current national commitments will provide. And so despite the fact that some vulnerable nations have been screaming for climate justice for at least two decades, in the last few COPs equity and justice has moved to the center of the most contentious issues in dispute. Now there is no escaping the international community from reviewing national commitments through a justice lens. The smaller the available budget becomes to avoid dangerous climate change, the more obvious the justice issues become. Nations must both increase emissions reductions commitments immediately to give the world any hope of avoiding dangerous climate change while also agreeing to an international framework on future ghg emissions which will limit global ghg emissions in the medium- and long-term. And so, some aspects of the Warsaw agenda are focused both on increasing ghg emissions commitments in the short-term while at the same time working toward a new climate change treaty which will include a framework for national ghg emissions reductions after 2020. This paper looks at the equitable aspects of the need for more ambition in national ghg emissions commitments in the short-term while the next entry will look at ethics and justice issues entailed by the need for a new climate change treaty that was agreed to in prior COPs and that is scheduled to come into effect in 2020. An adequate global climate change solution will need to limit total global ghg emissions to levels which will prevent atmospheric concentrations of ghgs from accumulating to dangerous levels and to do this any solution will also need to allocate total global emissions levels among all nations. Therefore each nation must agree to limit is emissions to its fair share of safe global emissions both in the short- and longer-term. There is now no way of escaping this urgent reality. Up until now, nations could pretend that baby steps toward a global solution were acceptable progress. The urgency of finding a global climate change solution now makes it clear that such pretense is foolish self-deception. Since the last COP in Qatar last year, there have been two prestigious scientific reports that have made it even more abundantly clear that much greater ambition from nations on their previous ghg emissions reduction commitments based upon equity are urgently needed. In 2013, IPCC in its recent Working Group I Report on the Physical Basis of Climate Change and UNEP in its just released the Emissions Gap Report are advising the international community that the world is quickly running out of time to prevent dangerous climate change. The UNEP report is particularly relevant to the short-term situation given that the international community has agreed to limit future warming to prevent catastrophic warming to 2° C or perhaps 1.5° C if later studies demonstrate that a 1.5° C warming limit is necessary to prevent catastrophic harms. The UNEP report found that even if nations meet their current climate pledges, ghg emissions in 2020 are likely to be 8 to 12 gigatonnes of CO2 equivalent (GtCO2e) above the level that would provide a likely chance of remaining on the least-cost pathway. To be on track to stay within the 2° C target and head off very dangerous climate change, the report says that emissions should be a maximum of 44 GtCO2e by 2020 to set the stage for further cuts needed keep warming from exceeding the 2° C target. UNEP pointed out in its report that the 44 GtCO2e target by 2020 is necessary to have any hope of achieving even greater cuts needed after 2020 when total emissions must be limited to sharply declining total emissions limitations. Moreover if the world continues under a business-as-usual scenario, which does not include pledges, 2020 emissions are predicted to reach 59 GtCO2e, which is 1 GtCO2e higher than was estimated in a UNEP report issued in 2012. Without doubt increasing the ambition of national ghg commitments is urgently needed to provide any reasonable hope of limiting warming to non-catastrophic levels. The September, 2013, IPCC issued a report which contained a budget on total carbon emissions that the world needs to stay within to give a 66% chance of preventing more than the 2° C warming that attracted world attention despite the fact that it has been widely criticized as being overly optimistic. This budget is an upper limit on total human CO2 equivalent emissions from the beginning of the industrial revolution until the day we stop burning carbon. The IPCC said that for warming to remain below last 2° C warming limit, the total amount of CO2 must be less than 1000 billion tons. The IPCC report estimated that we’ve already used 531 billion tons of that budget as of 2011 by burning fossil fuels for energy as well as by clearing forests for farming and myriad other uses. That means would mean that there is 469 tons left in the emissions budget. This further means that the budget would be completely used up by current emissions by around 2044, just over 30 years from now. Yet, the IPCC budget is likely significantly overly optimistic because ghg emissions other than CO2 are being emitted which the IPCC recent budget did not take into account. Factoring in the other ghgs brings the overall cumulative budget down from 1 trillion tons of carbon to 800 billion tons. With that in mind, the remaining budget is even smaller, leaving just 269 billion tons of carbon left. This figure screams for a radical increase in short-term and long-term ghg emissions national ghg emissions commitments. For this reason, climate change is a civilization challenging problem of distributive justice. The IPCC report also said that a possible release of ghg thawing permafrost and methane hydrates — which are “not accounted for in current models” — would shrink the remaining budget even further. So why is equity and justice considerations so vital to increasing national ambitions? There are several reasons for this. First some countries much more than others are contributing to global atmospheric ghg concentrations on a per capita and total tons basis. Other countries more than others have contributed much more historically to existing elevated ghg atmospneric concentrations as they pursued higher levels of economic growth. And some countries more than others should be allowed to increase energy use to emerge from grinding poverty especially since they have done almost nothing to cause the existing crisis. And so, climate change is a civilization challenging problem of distributive justice and no matter what ethical considerations are taken into account to define an arguably distributively just allocation of ghg emissions targets among nations, many national commitments utterly and obviously flunk any ethical test. Yet the international press is not covering this aspect of this civilization challenging problem. Ethics and justice demand that high-emitting nations and individuals reduce their emissions to their fair share of safe global emissions. Furthermore, it is already a settled principle in international law that polluters should pay for their pollution, that nations should reduce their emissions to prevent dangerous climate change on the basis of ‘equity,’ not national interest, and that nations should prevent their citizens from doing harm to people outside their national jurisdictional boundaries. These rules collectively mean that nations may not base their climate change national strategies on national interest because they they have duties, obligations, and responsibilities to others that they must take into account when setting national climate change policy. Yet hardly any nations are explaining their national ghg emissions reductions commitments on the basis of how they are congruent with their equitable obligations and the international media for the most part is ignoring this vital part of this civilization challenging drama unfolding in Warsaw. In addition, every national ghg emissions target is already implicitly a position on the nation’s appropriate fair share of safe global emissions because it is a global problem about which each nation must do its fair share. Any national ghg emissions reduction target is a statement about the nation’s commitment to solve a global problem which is putting hundreds of millions of existing people at risk and countless members of future generations. Furthermore, practically the nations of the world are not likely to increase ghg emissions targets unless those nations who are already exceeding their global fair share agree to reduce their ghg emissions. And so national ghg emissions reductions based on ethics and justice are both required on the basis of morality and are urgently practically needed. The obvious place to look for increases in ambition in national commitments is from nations that are obviously above emissions reduction levels that equity would require of them. As we shall see in the next paper on a longer-term framework for national emissions, there are several competing ethical frameworks for what constitutes any nations fair share of safe global emissions. 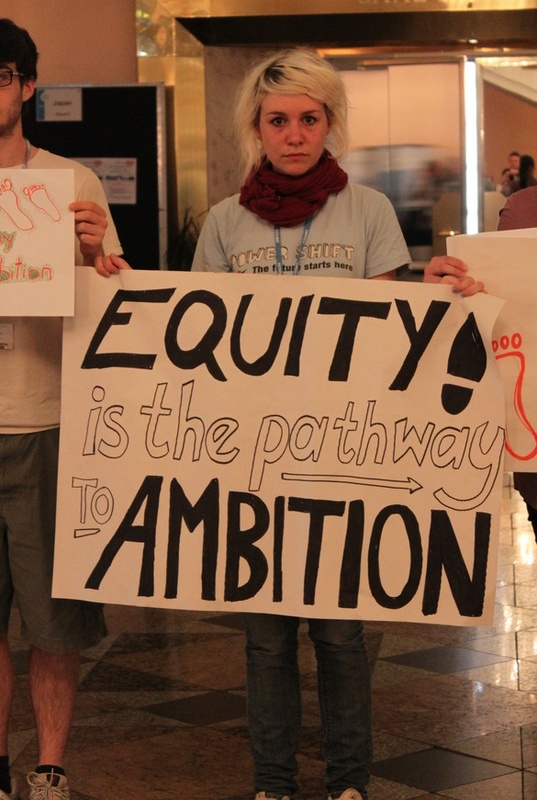 However, that does not mean that any position on “equity” passes minimum ethical scrutiny. And without any doubt, national ghg emissions targets based upon national economic interest alone flunks any ethical analysis because climate change requires nations to take into account how their ghg emissions are gravely harming the hundreds of millions of people around the world who are vulnerable to climate change in setting national climate change policies. That is under any conceivable ethical theory, nations must set ghg targets based upon their duties to not harm others, not self-interest alone. High-emitting nations are therefore obviously failing to set ghg emissions targets based upon their ethical obligations. In fact, as we have seen, nations often have admitted that their targets have been based upon self-interest not global duties. For this reason, a key issue on the Warsaw agenda is the ethical dimensions of short-term ghg emissions targets and the need for high-emitting nations in particular to increase their commitments. However, unfortunately at this moment, it is unlikely that countries will increase their emission reduction proposals in Warsaw. In fact, in some countries recent national policy changes call into question their capability to reach even their inadequate 2020 targets. Along this line, for instance, a recent backwards step of Australia was announced that it intends to abolish its newly established carbon pricing mechanism. 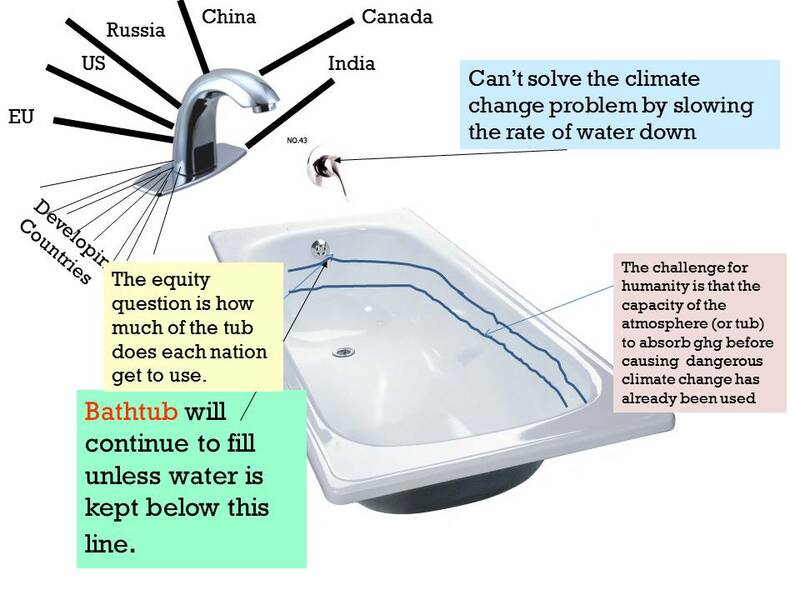 This entry was posted in Atmospheric Targets, equity and climate change, ethical problems with economic arguments, ethical questions raised by climate change, ethics of climate change, General Climate Ethics, global warming ethics, liability for climate change, Media Coverage of Climate Change, temperature limits, warsaw and tagged 2 degree warming limit, barriers to climate change policy, climate change and morality, climate change ethics, climate change policy, climate equity, climate ethics, climate ethics and policy, climate justice, equity and climate change, equity issues in warsaw climate talks, equity issues on Warsaw agenda, Ethics and Climate Change, national ghg emissions commitments, short-term carbon emissions targets, Warsaw, Warsaw climate negotiations by dabrown57. Bookmark the permalink. I get your point about accurate labeling, I agree. Yet the ethics and justice issues are haunting the negotiations but the press is not covering them.